Progressive Poker Ride is a new online progressive poker game developed by Microgaming, the leader in online casino software. Poker Ride is a game of skill and chance that is played with a single standard deck of 52 cards that are shuffled before each game (hand). The dealer and a player receive 2 cards each, then the player can choose to Call or Raise. The objective is to complete the game with the strongest hand. The most exciting feature in Poker Ride is an optional side bet that gives you a chance to win growing Progressive Jackpot. 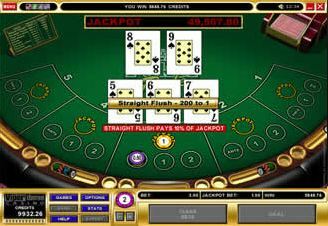 You win the Progressive Jackpot with a Royal Flush and 10% of the jackpot with a Straight Flush. Note that the side bet is optional and is fixed at 1 credit ($, €, £). Microgaming Poker Ride is similar to a (particularly popular in the US) land based table game called Let it Ride or Let 'Em Ride. The online casino game combines the fun of a popular table game with a progressive jackpot and is sure to give you lots of action and excitement. Players of Poker Ride can enjoy progressive poker action, high-quality graphics and all the other fantastic features found on Microgaming's Viper software platform. The house edge for a side bet is decreasing with the grow of jackpot and becomes negative starting from approximately $220,000. That's sure time to play and win big! Check out Poker Ride ticker on this page.. Poker Ride online progressive has paid out $231,722.81 to a total of 6 jackpot winners in August 2005 including David C who won $163,600.44 at Royal Vegas Casino. See all Poker Ride jackpot winners and their stories and testimonials.